Pivot Tables reorganize and summarize selected columns and rows of data in order for you to obtain a desired report. By default, a Pivot Table groups the selected column as the vertical sort field and the selected row as the horizontal sort field. The Pivot Tool enables you to select multiple group fields in the Pivot Table generated. The Pivot Tool contains a list of columns available in the active report and Group By, Across, and Measure sort fields. Click and drag the columns into the desired sort field. Create an active report with an output format of either active report for Adobe Flash Player (FLEX) or active report for PDF (APDF). 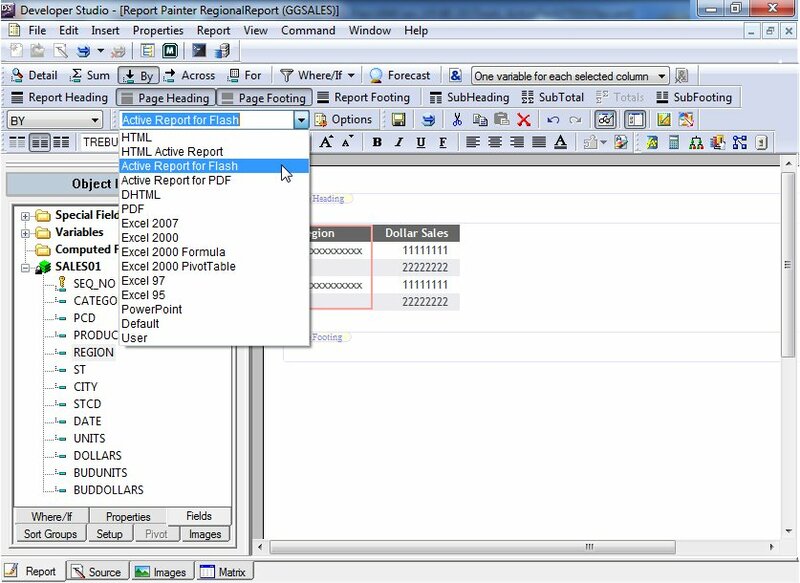 In the following image, active report for Flash is selected from the output format drop-down list on the Report Painter toolbar. In any column heading, click an arrow to display a drop-down menu. From the menu, click Pivot Tool, as shown in the following image. The Pivot Tool opens, as shown in the following image. Left-click and drag the desired columns into the Group By, Across, and Measure sort fields. You must include a column in the Group By and Measure sort fields (a Measure typically defines how much or how many). The Across sort field is optional. In the following example, Product and Category are the Group By sort fields, Region is the Across sort field, and Dollar Sales is the Measure field. You can edit the sort fields by clicking the X icon to delete columns, drag multiple columns into the Group By or Across sort fields, reorder the columns in the sort fields, and change the aggregation type of the Measure by clicking the Calculation icon. You cannot use multiple Measures. The Pivot Table is generated in a new window based on the sort fields selected, as shown in the following image. Click the close button, X, in the upper-right corner of the Pivot Tool to exit the tool. You can click the Menu icon on the Pivot Table toolbar, and click Pivot Tool, to open the Pivot Tool again. On the Pivot Table toolbar, you can optionally lock (freeze) the table by clicking the Lock icon, or change the aggregation type by clicking the Calculation icon. A Pivot table is not fully supported by the Active Technologies output format FLEX. The Group By and Measure sort fields are required. The same column cannot appear in both the Group By and Across sort fields. You can drag columns between the Group By, Across, and Measure sort fields, but you cannot drag the columns back into the Columns section. If a column already exists in the Measure sort field, an additional column that is dropped into the Measure sort field replaces the existing column. The Measure sort field displays Sum for numeric fields and Count for non-numeric fields by default.